When the glucose in honey forms sugar crystals, we call it “granulation” or “crystallization”. Depending mostly on the flowers the honey was made from, some honey will turn crystal even before the beekeeper can harvest it. Other types will not turn crystal for years, so crystallization is not a reliable indication of freshness. 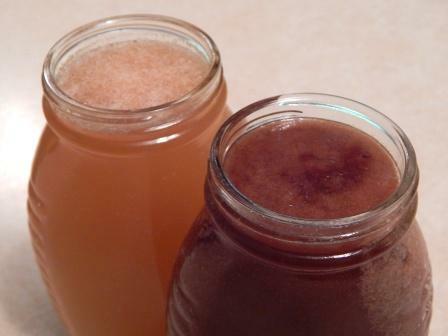 Two examples of raw unprocessed honey fully crystallized soon after harvest; one from spring harvest and one from fall. 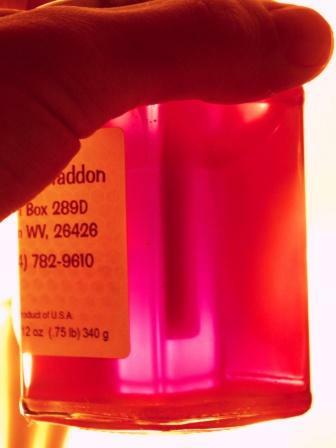 This beautiful dark honey harvested in 2012 has been stored in a cool basement for over five years and shows no sign of crystallization even when held up to strong light. 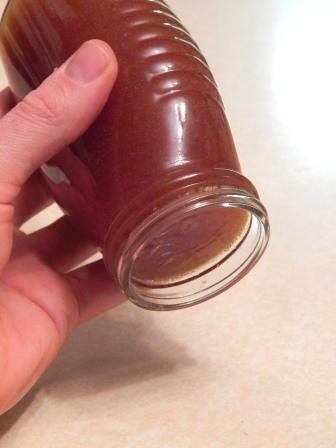 Crystal honey is less drippy, easy to spread, and has a pleasing texture. Big honey packers will heat and ultra-filtrate the honey to prevent crystallization so the product looks “prettier” on the shelf. However, eventually the heated honey will still crystallize. At Honey Glen, to preserve its natural enzymes and therapeutic properties, we never heat the honey. When our honey develops crystals, we sell crystal honey as a badge of our commitment to raw and natural. Some producers will cause the honey to crystallize at a very fine texture and sell it as Creamed Honey at an increased price. While there is nothing wrong with this process if the honey is kept raw, we prefer to simply allow the honey to crystallize naturally and sell it at the same price, and we love the larger crystals! We are pleased to see the public becoming more aware of the truth about crystallized honey, that it is superior to clear honey if the clear honey has been heated to keep it clear. Naturally crystallized honey is a flawless product, and for those who enjoy the crystalline texture and less drippy nature, crystallized honey is actually a superior product to clear honey even when both are fresh and unprocessed. Some honey will crystallize “solid” (think fudge texture) while others will crystallize only partly, depending on the floral source. Storing the honey at cool temperatures, such as in the refrigerator, will cause the honey to granulate faster. Keeping the honey frozen prevents granulation, while keeping the honey in a warm place will slow the granulation process. If desired, you can turn your honey clear again by placing the jar in a pan of hot water on the stove – just be aware that it is no longer raw. Never add water to honey, as this can cause fermentation. Honey takes on moisture from humid air, so try to keep honey away from humidity. There is a potential drawback to granulation: as the sugar crystals separate from the rest of the honey, the remaining solution acquires a higher moisture content. If it is high enough, the honey becomes more susceptible to fermentation. If your honey starts to taste fermented, the best thing to do is heat it as described above and skim off any foam – and it will be like new, only no longer raw.